My daughter wanted a cake with circles all over. So I made two tiered cake. The bottom one is 9 inches and the upper one is 6 inches one. The bottom one is double chocolate with fudge filling. The upper one is carrot cake with cream cheese and pecans filing. I used straws for support between layers. She specifically wanted them placed both coming from the back side of the cake, not in the middle of cake. I covered both of them with white buttercream. I airbrushed the upper using electric blue color. I made cut out of different sizes of circles using a cookie cutter. I used blue pearl dust for the one that were placed on the white side of the cake and I used blue pearl dust for the ones placed on the blue side of the cake. I made a white shell border around the cakes. 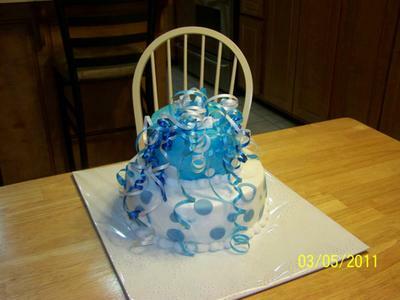 I made a white, royal blue and light blue curling ribbon arrangement as a cake topper.